Having difficulty choosing from hundreds of different types of artificial grass on the market? This guide will show you how to choose the best artificial grass for your lawn. You have decided that you are fed up with all the hard work and money that goes into keeping a real grass lawn beautiful for just a few months of the year and don’t like to look out on to a muddy mess during the winter. You want a lawn that looks vibrant and well manicured all year round. You are now faced with the potentially daunting task of choosing the grass that is best for your lawn. Well, there is good news: Choosing the best artificial grass for your lawn doesn’t need to be daunting. By asking yourself the right questions you can then decide which artificial grass is best for your needs. Here I will give you my top tips on how to choose the best artificial grass for your lawn. What will the artificial lawn be used for? Like choosing a carpet in your house or office you need to decide what your artificial lawn will be used for. Do you want the best-looking lawn possible i.e. A show lawn to impress all your friends and neighbours? A safe area where the kids can play without getting hurt? Or a great environment for your pets to run around in which is free from any toxins? You want a lawn that looks beautiful all year round that doesn’t have many people walking over it. Choose a grass that is hard wearing but hasn’t got too abrasive dense fibres. 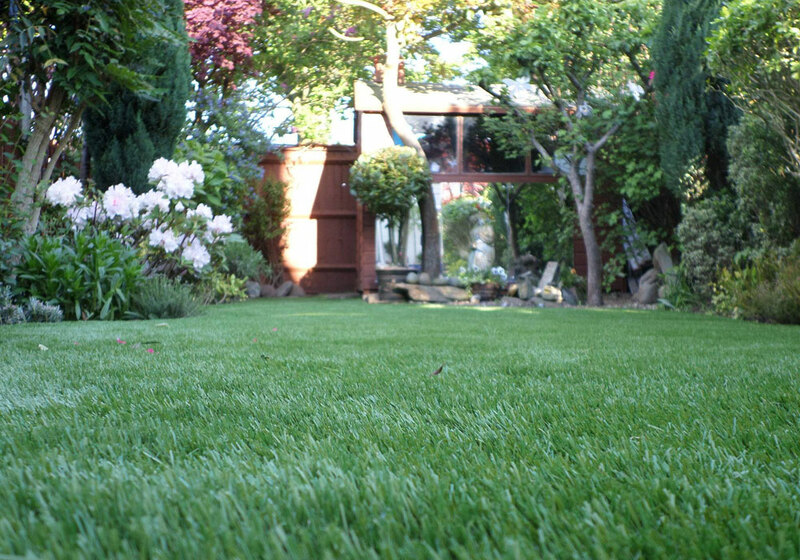 Take a look at our best seller the Grange for a great-looking grass with great colouration. One thing is almost certain. If you have young kids or even older ones for that matter they all like a game of football or tag. Within no time traditional grass lawns will be worn out and the underlying ground will become compressed and very hard which will be a danger if they fall. 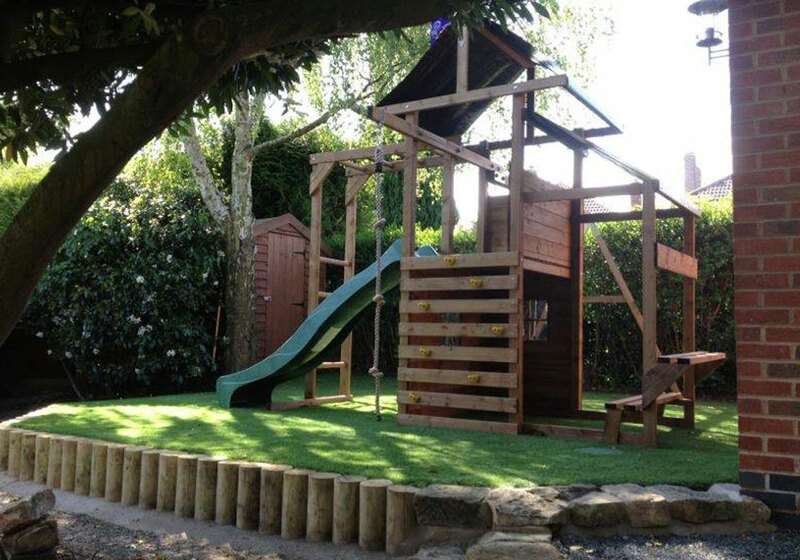 For gardens with a lot of usage from children we generally recommend a shorter pile artificial grass for even the very best long pile grasses will become flattened over time. An ideal grass in our range is the Outfield. Many dog owners use Perfect Grass because of brown patches, holes, dug up lawns and muddy footprints that their traditional grass lawns receive from their pets. We generally recommend a shorter pile grass such as the Outfield or one that stand up on its own like the Rectory as they are easier to clean. Also make sure the grass is highly permeable so the dog’s urine can run through. 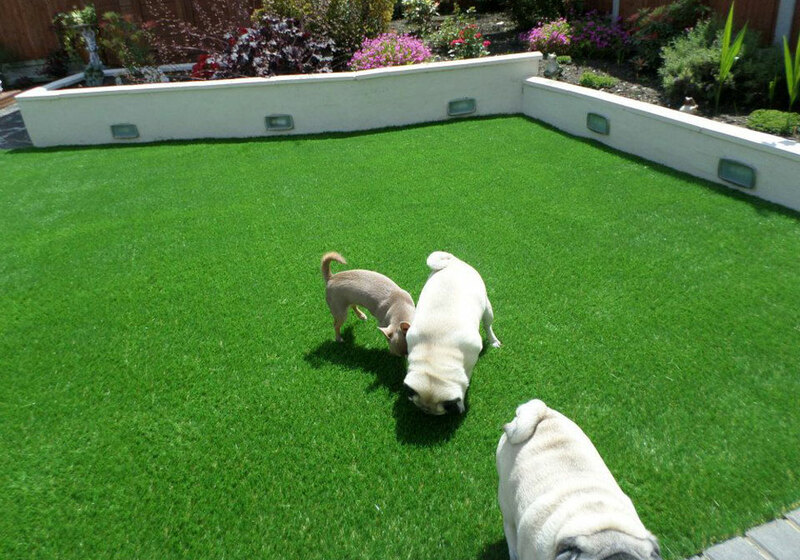 Take a look at our article on the best artificial grass for dogs which gives many useful ideas on installing artificial grass for owners with pets. It is important to understand how much a new artificial lawn will cost. Generally there is quite a substantial initial investment – depending obviously on the size of your lawn, the grass you choose and whether you want a company to install the grass as well as supply it. These initial costs will be eroded over time with the savings you make from the maintenance of real grass. To get a rough idea of how much you new artificial lawn will cost you will need to measure your garden. Decent quality grasses ranges from £17 to £40 per sqm. If you require installation there is an extra charge for this, which will cost on average between £25 to £35 per sqm. The price of installation will vary depending on the amount of groundworks required, ease of access plus a number of other variables. Where and how is the grass made? Where was the grass made? There are many cheap, badly made artificial grass products flooding the market many of which are being imported from China. These grasses suffer from random striping and over glued backing which causes puffing. Choosing a grass from within the EU will give you many more guarantees. All our grass products are sourced from the EU. Look at the grass to make sure it is free from harmful toxins or chemicals and is 100% recyclable. You wouldn’t want your pet or child playing in a garden where they are exposed to harmful chemicals. Has the grass been tested? Is the grass tested to the latest British and European standards to ensure the safety, quality and durability of the grass? What fibres does the grass have? Some grasses cost more due to having more fibres and how the fibres are put together i.e. V shape fibres to simulate tufting in real grass. Some of the better fibres are self-correcting and stand back up after walking on it ‘the Heath’ and don’t remain flat. Real lawns all have their flaws. For instance look closely and you will never see a real lawn that is 100% green. To obtain the ‘real grass look’ and avoid the ‘fake lawn look’ the better artificial grass products will have a brown thatch to add depth and have 3 or 4 different colour fibres in them. Check the grass is UV resistant otherwise it will discolour in the sun. You now have a good idea of the type of grass you are looking for. We can send out a sample of the grass/grasses you like so you can view it in the area you want to lay it. Hopefully by following my guide on how to choose the best artificial grass for your lawn it will make choosing your artificial grass less daunting and you will get the beautiful lawn that you have been looking for. In my next Blog post I will give you a guide on the importance of installing good groundworks. Having good groundworks in place will provide the solid foundations for your artificial grass to lie on for years to come. Need more help with choosing artificial grass for your lawn please leave your comment below and I will respond to it asap.